Ride along with us as we attempt to put together some fast laps around Big Willow in Mercedes-AMG’s new Porsche 911 fighter, the GT. Here in the uprated “S” trim, the GT S boasts 503 horsepower and 479 lb-ft of torque from its brand new “M178” engine, a 4.0-liter, biturbocharged and dry-sump lubricated V8, which sends power to the rear wheels by way of a seven-speed dual clutch transmission and an electronically controlled limited slip differential. Replacing the venerable SLS in AMG’s lineup is no easy task. While the SLS had a reputation for being a bit unruly at times but engaging in the right hands, this new GT is an unproven commodity. With a smaller footprint that’s closer in line with the Porsche 911, an all-new drivetrain and trick performance technology like dynamic engine mounts, which help hold the mass of the motor in place during hard cornering, the GT S has a lot going for it on paper. But it’s still an uphill battle for a new sports car to win the hearts and minds of enthusiasts, particularly ones who’re cross-shopping Porsches. 14.2-inch steel disc brakes at all four corners are standard on the GT, while the GT S features 15.4-inch rotors up front with red brake calipers. An optional carbon ceramic brake system is available to both models and measures 15.8 inches at the front and 14.2 inches at the rear. In terms of wheels, forged 19x9-inch rollers are mounted up front and 19x11-inch wheels are housed in the rear as standard on the GT (with 255/35 and 295/35 tires, front and rear), while the GT S gets larger 20x11-inch wheels in the rear and wider 265/35 and 295/35 tires, front and rear respectively. Of course the full suite of AMG Dynamic Select options are found in the GT and GT S, which include Controlled Efficiency, Sport, and Sport Plus modes. An all-new Individual mode will also be on hand in the GT and GT S, allowing the driver to individually customize the characteristics of the engine, transmission, suspension damping, exhaust and other driving parameters to taste. Codenamed the M178, the new 4.0-liter V8 cranks out 503 horsepower and 479 pound-feet of torque in the GT S. While turbocharging is a great solution for adding power while maintaining some reasonable fuel economy, many enthusiasts bemoaned this forced induction trend because turbos more often than not yield turbo lag. 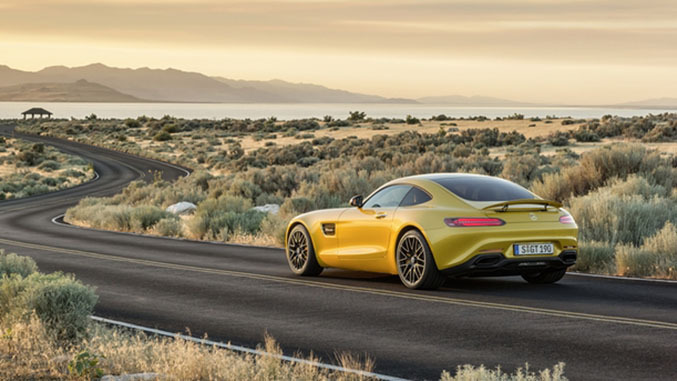 Fortunately that doesn’t seem to be an issue for the Mercedes-AMG GT S – there just aren't any perceptible gaps in power delivery, not on the race track anyway. So how’d they accomplish this feat? One of the strategies was turbocharger placement. In a nutshell, the more plumbing that’s involved in a turbocharger setup, the more likely you are to experience lag. 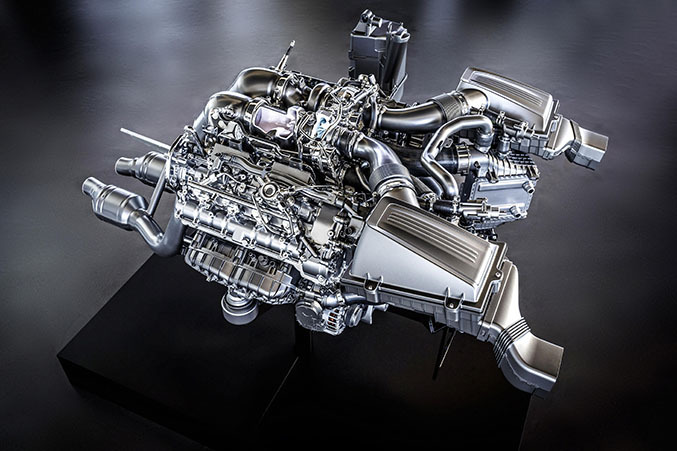 So rather than mounting the turbos in front of the engine, AMG engineers instead mounted them in the valley of the “V” in the V8, between the two banks of cylinders. Of course there are other inherent attributes of turbocharging that are unavoidable – its effect on the exhaust note, for instance. The old 6.3-liter V8 was known for its muscle car-esque bellow, and while the new 4.0-liter V8 does have a growl to it, it’s noticeably more muted than its predecessor. But considering how encouraging our initial impressions are of this new AMG sports car, it’s a small drawback that we’ll gladly accept for a car that’s this rewarding to drive. Shop gear for race cars at the Winding Road Racing online store.